Tessa is a Husky/Jack Russell puppy who embodies all the perfect qualities that someone could ever want in a puppy…she’s cute, very intelligent, happy, & loves everyone! Tessa’s family are the most conscientious, caring, & dedicated owners a puppy could ever hope for. 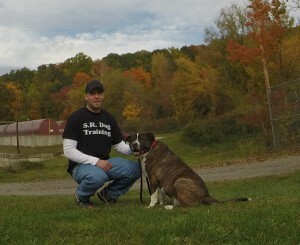 They understand the importance of proper training, so they contacted me for puppy training Putnam NY. We started Tessa’s puppy training in Putnam NY at 10 weeks old and now look at her just a few weeks later, working on obedience commands in her family’s company office. Molly is a 4 month old Pit Bull puppy. Her owner reached out to me for Puppy Training Putnam NY, because she was afraid Molly was displaying dominant behaviors. After a complete initial consultation, I was able to determine that Molly was not being “dominant” as they initially thought. In fact, Molly was just being an out of control puppy. She is a high energy dog with a bold personality. Those two attributes coupled with the fact that she was never properly thought how to act, led to her developing bratty behaviors. This is not uncommon, this is the norm for so many owners who never set clear structure for their puppy from the start. The best thing new puppy owners can do, is to take a proactive approach and start training early. In just one training session, I was able to ease her family’s minds, reduce their stress, and teach them how to properly communicate to Molly (in a way she will understand) that the way she was acting is no longer the right way to act. 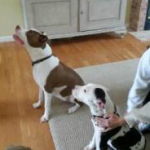 I worked with Odie, his Pit Bull brother, and his foster family on puppy training Putnam NY. 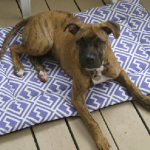 His family was struggling with housebreaking issues, leash pulling/biting, and other typical “puppy like” behavior that is common with puppy training. I receive calls/emails daily from owners who are struggling with puppy training Putnam NY – housebreaking, crate training, managing their dog’s high energy and “craziness” in the home (jumping on furniture, mouthing, etc.). These are very common issues that can be addressed by making a few key changes, and setting clear expectations the dog understands. This is exactly what we did with Odie in order to transform his behavior. Odie has successfully moved from his foster home, into a loving forever home. I have developed a specific program that is designed to help with the “puppy stage” of a dog’s life. My puppy training program addresses housebreaking, crate training, and all the other “puppy issues”. Puppyhood should not be a stressful time, but rather a fun learning and bonding experience for both dog and owner. Odie and his family benefited from my Puppy Training Putnam NY, and you can too. Aria is a 10 week old Pitbull puppy whose owner contacted me for help with housebreaking, crate training, a high level of energy, and mouthing/chewing tendencies. This behavior can be very challenging and frustrating for puppy owners. Aria was one of the most difficult housebreaking cases I have ever seen. She was having frequent and unexpected accidents in the home. Most trainers would have been at a loss for how help, by we were able to solve her housebreaking and crate training issues. We utilized my puppy training protocol which covers proper pack structure, setting rules/boundaries, diet, exercise, and an extensive housebreaking/crate training program. 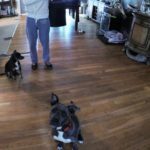 Puppy training in Putnam NY or anywhere else does NOT need to be a confusing and stressful time. With the right puppy training protocol, we were able to successfully housebreak, crate train, and guide Aria through puppyhood. “Hi Steve, I thought you might want to see a picture of Aria at almost 9 months old. Thanks to your wonderful rapport with Aria, your patience, and your very good training tips, Aria is a happy, good-natured dog. She is housebroken, crate trained (without you, this would have never happened), she walks well on the leash, and she has finally learned sit, down, paw, up, and off. We are working on leave it, but she likes my slippers too much. I absolutely love your facebook page and your website. You have no idea how many times I refer to both and then use what I learn with Aria. As far as I am concerned, the Dog Whisperer does not hold a candle to you.